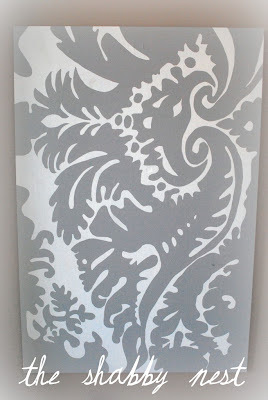 In the case of my room, I really wanted to incorporate gray damask. I was hoping to use it for the curtains, but with the amount of yardage I needed, my budget would have been sunk. 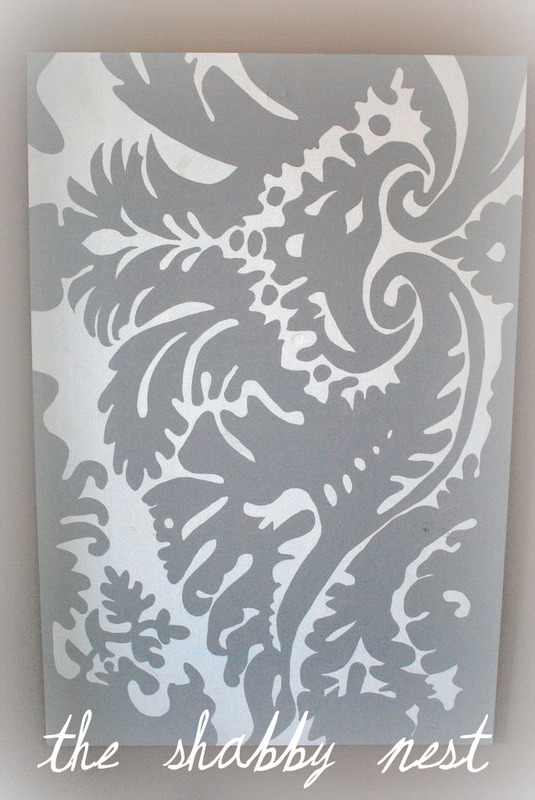 So I decided to bring the damask into the room in a stylized piece of art. 2. 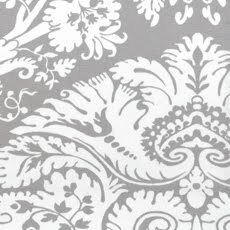 I found a damask pattern I liked. In this case, it was a picture of a fabric sample, Natele from Duralee, which I printed out so that I would have a pattern to work from. As you can see, the pattern was quite intricate, so I tried to simplify it as I drew it out...but I'll get to that in a minute. 3. I painted the piece of wood (or canvas) the background color of my pattern. In this case white. I used the same paint from my bedroom project...interior latex in white and dove gray. I would suggest using a graphic print and limiting your painting to 2 colors...unless you are a real artist. It will make the project look more professional in the end. In my case, I used the projector, and actually wish I had just freehanded it because when you compare my inspiration pattern to the actual painting you can see how the projector distorted the image. I also had a difficult time actually seeing all the lines I needed to trace. In the end I had to fix a few things, and the image is still a little off. Oh well, live and learn right? 5. Now use your other color and fill in the pattern. It's simple...just like coloring in the lines...except with a paintbrush. You'll notice that I reversed the colors in my painting using gray for the motif and white for the background. This is because I actually wanted the finished painting to be more gray than white. You can also see that I rotated the design 90 degrees...that's just because I liked the composition better that way. 6. VOILA! A custom work of art. Don't forget tomorrow is Frugal Friday again!! MckLinky goes up at 12:00 am EST for all you night owls. And this week's winner will be announced at So You Think You Can Decorate on Saturday...next week's challenge goes up on Sunday. You can vote until Friday at 12:00 MST. Beautiful post, I am so glad I stumbled into your blog. Love it! I'm trying to figure out what art I want to make for our master bedroom makeover... Adding this to the file... thanks! Okay, I don't even know what Damask is. I think I just disqualified myself from reading your blog. Kicked out of the club. Whatever that is, it looks great and I will never try to do that at home without a skilled adult supervising me. You go girl! That turned out great. It's beautiful. love it!! i miss my college art classes where we had a photo projector! it just made life and art so much easier! Pretty pretty! You make me want to redo my bedroom. I think it's time just dont know where to start. Love this! Thanks for sharing! have a blessed day! Great idea! I love the way it turned out and don't mind the "distortion" at all. It's a fab way to make a big impact on the cheap. holy cow woman, i just glanced over & saw you have almost 2,000 followers...you are a total rockstar!! i love it! ooooh,...so fun!! I like the simple drama of it. 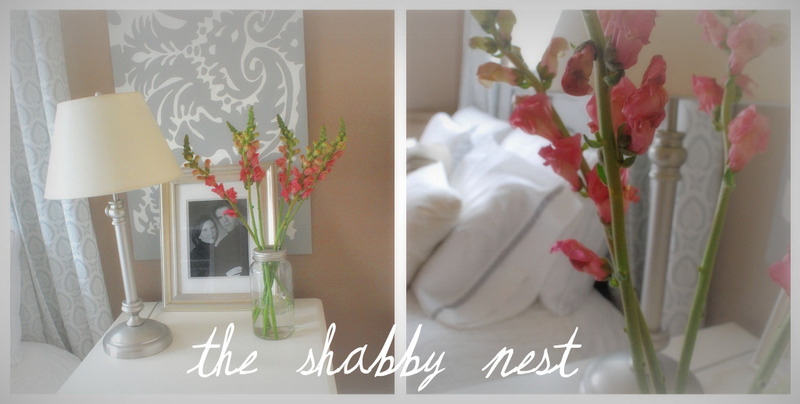 We are redoing our master bedroom in gray and I will so steal this idea! I love it! Love your Art- I think i might give it a try-for my new store..
Once again, your ideas are wonderful.. I'm an artist - an easy, easy way to trace if you don't have a projector is to take the printout of your pattern and rub a pencil all over the back (or charcoal works too). Lay the print face up on your canvase and use masking tape to hold in place on all four sides. Take a ball point pen and trace the outline and details using medium pressure. Gently remove your printout and voila! You have a very light outline of your pattern! I use this method all the time when I'm doing portraits.